When writing a blog, I must first make sure the topic I ultimately decide on is not only something I’m extremely passionate about, but also something I’m very interested in. For me, picking a blog topic isn’t always such an easy to-do. Landing on a subject to write on can take hours on end, maybe even days, weeks, or years! But this time, it wasn’t so tough. I made a decision in literally five seconds. So what am I passionate about you ask? Family, why yes! Advertising & Design, of course! Justin Timberlake, sure, whatever. Taco Bell, DANG RIGHT! Don’t believe me? Just look at my Current 360 Bio! The No. 9 Crunchwrap Supreme is my LIFELINE! Without it, I could not survive. These days, I’ve been seeing a lot of this classy fast food joint in the news, and more importantly in my social media feed. Known for their social media sass, Taco Bell’s Twitter feed is notoriously lively, and their Facebook page is just as poppin’! Social media can be a powerful tool for any company or agency. Facebook, Twitter, Google+ and other platforms are excellent at communicating with customers, building brands, and generating buzz and attention. Unfortunately, many companies fail to take advantage of the benefits social media provides. But this week, Taco Bell showed it understands exactly how to use this powerful tool! 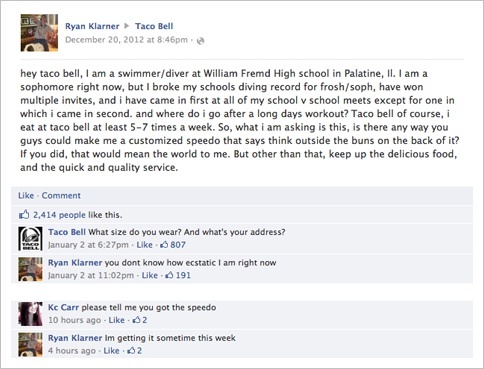 The high school swimmer, Ryan Klarner, asked Taco Bell directly on their Facebook page, and a few weeks later he received a request for his address and size, and a shortly after said Speedo appeared on his doorstep, free of charge from his friends at Taco Bell’s social media team. You can see immediately that this was a genius move by Taco Bell’s social media team. This is the sort of bizarre action that goes viral. It’s hilarious, and unexpected, not to mention it gets everyone’s attention. Taco Bell turned an innocent post into a virtual gold mine for building its strong brand. 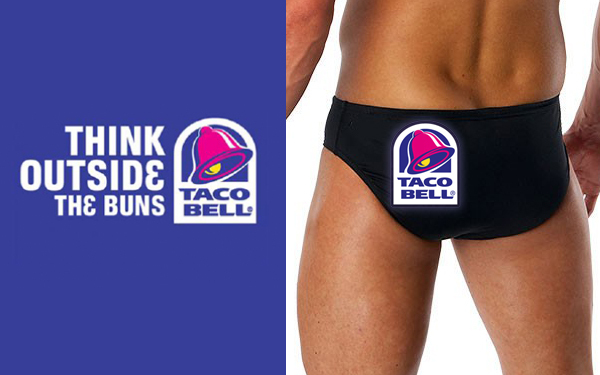 I think many businesses have trouble rising to the challenge of connecting with their audiences in an unexpected way, but Taco Bell definitely steps out of the mold and has fun with their fans! They weren’t trying to sell anything, nor were they ignoring the request as ridiculous. By responding they turned a fan into an even greater fan and got more press than they could have paid for. To me that’s a successful social media team at work. What do you think? Is this clever and funny social media marketing, or has it gone too far?